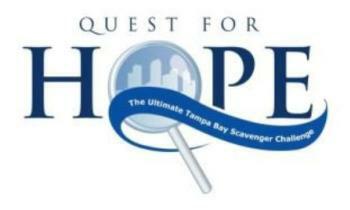 This weekend, Ybor City will host the 7th Annual Quest for Hope: The Ultimate Tampa Bay Scavenger Challenge! From 4 p.m.- 8 p.m. on Saturday, July 27, 50 teams of 2-6 members will scavenge bars, shops and restaurants sprawling Ybor City for a chance to win prizes and bragging rights as Tampa Bay’s “Ultimate” Scavengers! Be warned though, this is no ordinary scavenger hunt. In addition to the traditional hunt, teams will take on challenges that will tempt their taste buds, get them dancing, test their athletic abilities and more! The best part of the whole thing? Proceeds from entry fees will go to a great cause! The 1Voice Foundation, a non-profit dedicated to fighting cancer and chronic blood disorders in children, is partnering with The Florida Aquarium and the Krewe of the Nautilus to offer affected children and families the chance to participate in beach and ocean conservation activities. Tickets are $100 per person. For more details and information on how to get in on the hunt, visit www.quest4hope.org. Stay tuned to discover more to do this weekend in Tampa Bay, and happy scavenging!